In honor of more than three decades of excellence in mentoring, the American Heart Association’s Council on Epidemiology and Prevention has awarded Thomas A. Pearson, M.D., Ph.D., M.P.H., the 2019 Epidemiology and Prevention Mentoring Award. The award recognizes professionals who have provided exceptional individual and institutional mentoring and advocacy for cardiovascular epidemiology researchers. Pearson will be honored during the American Heart Association’s Epidemiology and Prevention/Lifestyle and Cardiometabolic Health 2019 Scientific Sessions held next month in Houston. 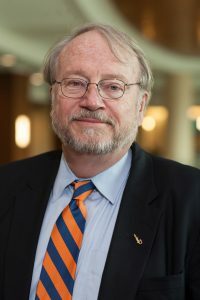 A professor in the department of epidemiology at the UF College of Public Health and Health Professions and the College of Medicine and director of the M.D.-Ph.D. program, Pearson’s research has focused on cardiovascular epidemiology, clinical lipidology and precision public health. His work has been continuously funded by the National Institutes of Health for 35 years. Over the course of his career, Pearson has served as the program director for six institutional NIH T32 training grants, including a current program in genomic medicine, co-directed with Julie Johnson, Ph.D., dean and distinguished professor at the UF College of Pharmacy. He has also served as chief mentor for 14 NIH career development awards, and mentored 67 professionals who hold positions in academia and industry. As director of the UF Clinical and Translational Science Translational Workforce Development Program, Pearson has been instrumental in growing the Clinical and Translational Science Institute’s KL2 Training Grant program, which provides financial support and research training for junior faculty. Under his leadership, the university has significantly increased the number of T32 training grants, K award career development grants and NIH loan repayment grants, providing financial and mentoring support for doctoral students, postdoctoral associates and junior faculty members. UF now has what is believed to be the highest number of these grants in the university’s history. Pearson is a Fellow of the American Heart Association, the American College of Cardiology, the American College of Preventive Medicine and the American College of Physicians. He was awarded the Lifetime Mentoring Award from the University of Rochester School of Medicine in 2010.